Certain flavor combinations are alchemical, like bacon + cheese + onions. I feel the same spine-tingliness the first time I experienced honey + garlic + black pepper. I had it on fried chicken wings and it deeply moved me. Later, I found the sauce glazed over crispy strips of beef tenderloin at an upscale Chinese restaurant in Hong Kong. Hoooo boy. There’s one more component that must be present alongside honey, garlic, and black pepper, and that’s crispiness. Foods that are crispy and sticky I find deeply satisfying, and the following recipe I developed—inspired by Chinese takeout joints—checks off those boxes. This dish demands to be served with rice and a crunchy vegetable such as bok choy, Chinese broccoli, or standard broccoli. For my first attempt I used chuck steak. I figured a fattier cut of meat means more flavor, right? True, but chuck steak is also a tougher cut, more appropriate for long braises. For a recipe with such a flavorful sauce, I’d opt for a leaner, more tender cut. Flank steak is the way to go here. You don’t realize the potency of soy sauce until you taste it and immediately feel your kidneys seizing up. After some consulting, I discovered the answer: Chinese finishing sauces are often diluted with broth, then mixed with a corn starch slurry to achieve that glossy thickness. I’ve said this before, but Eileen Yin-Fei Lo’s book Mastering The Art Of Chinese Cooking really should be a cookbook you own. I’m using her batter and “two deep-fry, one-stir-fry” method of frying beef from page 165. In mixing bowl, toss sliced beef with sugar, baking soda and salt, coating evenly. Let sit in refrigerator for at least 20 minutes. Meanwhile in separate bowl, combine soy sauce, honey, mirin/cooking wine, sesame oil, and chicken broth. In large saucepan over medium-low heat, add a tablespoon of vegetable oil and add minced garlic. You don’t want to burn the garlic, much less brown it, but more to soften and release its aroma. After 2-3 minutes, add the soy sauce-broth mixture to the lightly sautéed garlic and turn heat up to medium-high, bringing to a simmer. Add lots of black pepper, then turn off heat and set aside as you work on the beef. Remove beef bowl from fridge, and add the egg white and two tablespoons of corn starch. Mix well, the beef should be lightly battered and goopy. Place back in fridge for 10 more minutes. In a wok or heavy-bottomed skillet, fill with vegetable or peanut oil to a depth of an inch. If you have a candy thermometer, use it here: You want the oil to be 375 degrees Fahrenheit. 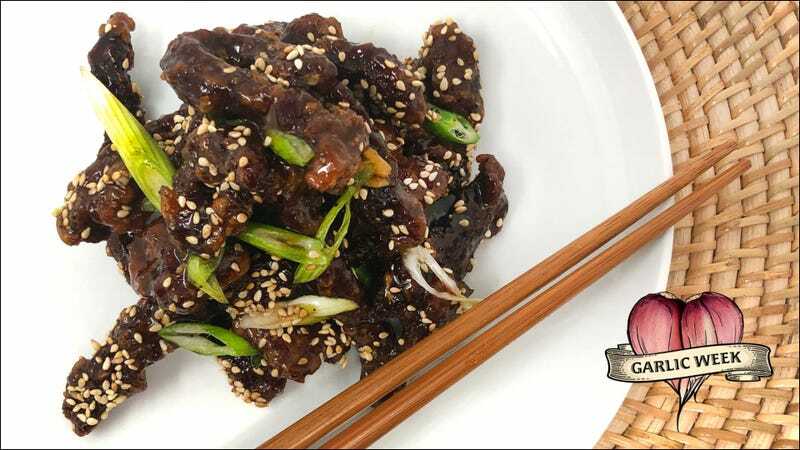 Remove battered beef from fridge, and once the oil hits that temperature, use bamboo chopsticks or tongs to add beef to the hot oil, loosening up the strips. After about 3-4 minutes, the beef should be beautifully crisp and golden brown. Remove to a rack for draining. Once the beef is done frying, bring the soy sauce mixture back to a simmer. Mix the teaspoon each of corn starch and water together, then stir into your sauce. Simmer for a minute to thicken. Toss the crispy beef strips into this glaze, plate onto large serving dish, drizzle a good amount of honey, and crack more pepper. Sprinkle with sesame seeds and scallion to finish.